A Machine Like No Other This just may be the Rotary Transfer machine you've been waiting for. 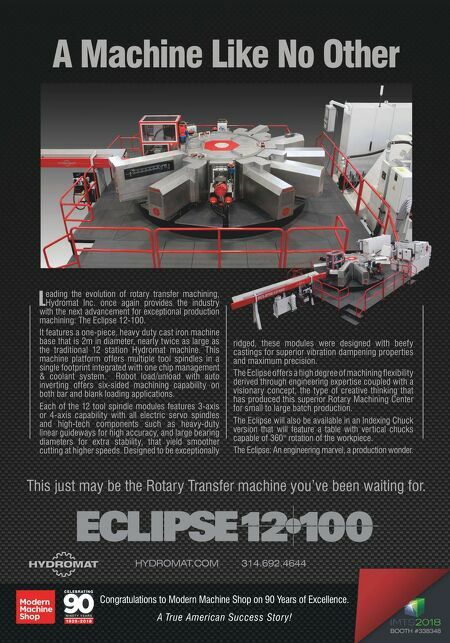 L eading the evolution of rotary transfer machining, Hydromat Inc. once again provides the industry with the next advancement for exceptional production machining: The Eclipse 12-100. It features a one-piece, heavy duty cast iron machine base that is 2m in diameter, nearly twice as large as the traditional 12 station Hydromat machine. This machine platform offers multiple tool spindles in a single footprint integrated with one chip management & coolant system. Robot load/unload with auto inverting offers six-sided machining capability on both bar and blank loading applications. Each of the 12 tool spindle modules features 3-axis or 4-axis capability with all electric servo spindles and high-tech components such as heavy-duty linear guideways for high accuracy, and large bearing diameters for extra stability, that yield smoother cutting at higher speeds. Designed to be exceptionally ridged, these modules were designed with beefy castings for superior vibration dampening properties and maximum precision. The Eclipse offers a high degree of machining flexibility derived through engineering expertise coupled with a visionary concept, the type of creative thinking that has produced this superior Rotary Machining Center for small to large batch production. The Eclipse will also be available in an Indexing Chuck version that will feature a table with vertical chucks capable of 360° rotation of the workpiece. The Eclipse: An engineering marvel, a production wonder. 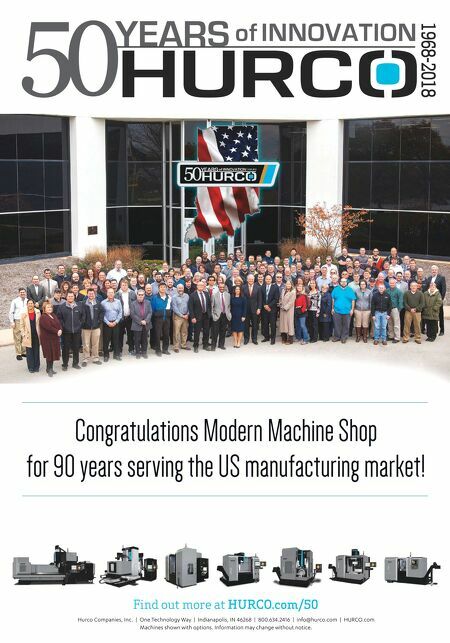 HYDROMAT.COM 314.692.4644 BOOTH #338348 Congratulations to Modern Machine Shop on 90 Years of Excellence. A True American Success Stor y!